A portrait of Arthur Capper who owned several newspapers including Cappers Weekly and two radio stations. He was active in politics and served as Kansas Governor from 1915 to 1919 and United States Senator from 1919 to 1949. The portrait is autographed to his personal friend Art Schultz. This report was created by the Great Plains Committee, which had been called by President Roosevelt to investigate the effects of drought and wind erosion in the southwestern United States. Chapter IV of the report, titled "Destructive Effects of Undesirable Tendencies," outlines some of the major problems in this region, composed of North Dakota, South Dakota, Nebraska, Kansas, Oklahoma, Texas, New Mexico, Colorado, Wyoming, and Montana. These problems included the decreasing amount of range land, soil erosion, and the depletion of ground water. A large part of the chapter deals with relief efforts and homestead rehabilitation. It also contains illustrations and tables that provide comparative data on the situation in each of these states. This photograph captures one of the hardships faced by families during the Dust Bowl--starving cattle. 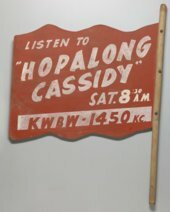 It was taken in Kansas City, Kansas, by the Kansas Emergency Relief Committee, a state agency working to relieve the financial burdens of families suffering during the droughts of the 1930s. The KERC worked alongside the Agricultural Adjustment Administration, which began a cattle-purchasing program in 1934. Emaciated cattle (as in this photograph) were destroyed after purchase, and healthy cattle were shipped to slaughter with the meat being distributed to poor families needing relief. This brief article discusses how farmers in southwestern Kansas were reseeding sod on land that had formerly been planted with wheat. This reseeding effort, which aimed to stabilize soil, was directed by the Soil Conservation Service. In this document, Edith Monfort asks the Republican nominee Eisenhower to take a leadership position on the proposed solution to flood control in Kansas. Three Kansas dams have been proposed, Tuttle Creek, Milford and Perry. The Kansas Watershed Association questions judgment of this proposal. Eisenhower grew up in Abilene, Kansas. This letter from Edna and Bill Heim was sent to Clarice Snoddy, a resident of Topeka. The Heims were caring for Snoddy's farm in Smith County and thus remained in close contact. Mrs. Heim describes the condition of the wheat crop, which has suffered during the drought and also expresses her distaste for relief programs. According to Mrs. Heim, the only people who receive relief are those who have not "helped themselves." 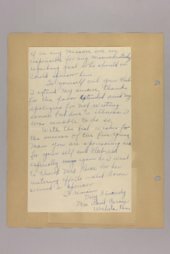 Tenant farmers Bill and Edna Heim of Kensington, Kansas, wrote this letter to farm owner Clarice Snoddy of Topeka regarding drought conditions and government soil conservation programs on the farm. The letter demonstrates the use of local and federal government programs to counter the removal of a dangerous amount of topsoil from farms on the southern Plains. Kansas began appealing for emergency federal aid in 1937 to counter sever drought and wind erosion in what is commonly known as the Dust Bowl. This file includes subject correspondence relating to agricultural legislation and implementation by the Federal Truck Commission. This file is part of a bigger collection of Governor Clyde M. Reed correspondence. 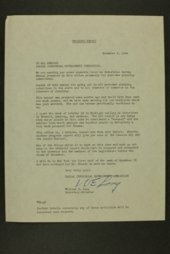 This file includes subject correspondence relating to the Farm Union which is part of a bigger collection of Governor Clyde M. Reed correspondence. This file includes subject correspondence relating to Federal Farm Loans which is part of a bigger collection of Governor Clyde M. Reed correspondence. This is the second file of four including subject correspondence relating to tax matters. Topics in the correspondence cover but is not limited to the formation of the Taxpayers' League in Wichita, Kansas, the intangible tax, and farm taxes. This file is part of a bigger collection of Governor Clyde M. Reed correspondence. See also Unit IDs 450971, 450973 and 450974. This is the first of four files including subject correspondence relating to tax matters. Topics in the correspondence cover but is not limited to the proposed increase of the gasoline tax, State Tax Code Commission, and taxes causing difficutly for farmers. This file is part of a bigger collection of Governor Clyde M. Reed correspondence. See also Unit IDs 450972, 450973 and 450974. Secretary of the Emergency Dust Bowl Committee H. A. Kinney of Liberal (Seward County) sends Governor Walter Huxman of Topeka (Shawnee County) a copy of a telegram the committee sent President Franklin Roosevelt. The telegram appeals to the federal government for assistance in stopping the removal of top soil in the drought stricken areas of Oklahoma, Texas, New Mexico, Colorado, and Kansas. The telegram advises that the present program of management by individual farmers is inadequate. H. A. Kinney was also Secretary of the Liberal Chamber of Commerce. In this letter Howard Bucknell, president of the Jewell County Farm Bureau, updates Governor Landon on the drought situation in his county. There was an acute water shortage, forcing Jewell county farmers to request aid from the relief funds being distributed by the state. This file includes general correspondence relating to the International Dry-Farming Congress held in Denver, Colorado from September 27 to October 9, 1915. Topics included, but not limited to, in the correspondence is exhibits at the International Soil-Product Exposition held in conjunction with the International Dry-Farming Congress, bills to fund the proposed exhibit, and attendance to the Congress. This is part of a bigger collection of Governor Arthur Capper correspondence. This oral history interview with Olive Kramer of Hugoton, Stevens County, describes her experiences during the dust bowl of the 1930s. She devotes much of her interview to reminiscing about how these dust storms interrupted the daily routines of those living in western Kansas. She also mentions government programs -- such as the cattle purchase program -- that provided relief for citizens suffering from unemployment. During a particularly bad spell, her husband (who also gave an interview) sent her and their children east to Kansas City (it is not clear for how long). Kramer talks also about the emergency hospital set up in the basement of the Methodist Church to care for the residents dealing with dust pneumonia. Copied from Dust Storms as Remembered by Hugoton Citizens. This bouchure includes a map of Kansas showing the routes of the Atchison, Topeka and Santa Fe Railroad within the State of Kansas. Shading on both sides of the main line of the railroad indicates the Land Grant. All unsold lands are within a colored portion of the map. The brouchure includes a smaller map showing all of the Atchison, Topeka and Santa Fe routes and connecting lines in the United States and Mexico. The brouchure advertises "Land Explorers' Round-trip Tickets", good for forty days at cheap rates. Approximately 18 panels describe these features of Kansas agriculture to be in good condition: dairy, Kansas sugar, irrigation, railroad lands, vacant lands, manufacturing, fuel supply, and education in Kansas. A portrait of Nancy Landon Kassebaum, United States Senator from Kansas, 1978-1997, and the daughter of Kansas Governor Alfred Mossiman Landon.